Omnigrid 4.5'' scissor regularly priced $19.99, today $11.99. Omnigrid 8'' scissor regularly priced $28.99, today $17.49. Omnigrid's 4-inch Scissors are a handy little pair of knife edge scissors with extra sharp points that are perfect for applique and miniature work. Use for emboidery, needlework, and cross stitch. Also great for ripping seams. Stainless steel blades. Careful: These things are sharp! 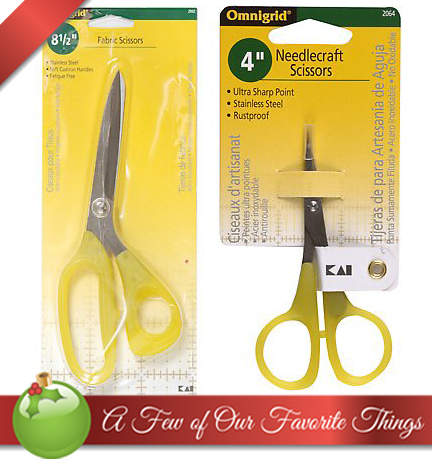 Omnigrid 8-1/2-inch Fabric Scissors are heavy duty with extremely sharp blades for thicker fabrics and layers, and have longer blades for longer cuts. The bent handle is for surface support, to insure accurate cutting. Their soft cushion handles provide for comfort.